One of the greatest confusions in the food world is that when the weather around the country changes to dark and grey, freezing and gloomy, the markets are filled with the absolute brightest of citrus fruit. Oranges of all shapes and sizes, tangerines, blood oranges, meyer lemons, and every shade in between. This is something I’ve never understood and after years of trying, I’m finally going to stop. It’s a beautiful thing so we might as well embrace it right? Especially if you live in the Northeast like I do, or anywhere where the snow-dumping never stops, a beam of sunshine on a plate of food is a very very welcome thing. I remember the first time I had Deb from Smitten Kitchen’s Whole Lemon Tart. It was 2012 and on my birthday, my fantastic baker of a roommate asked what I wanted for dessert. While most people might have been so gracious as to say “anything is fine!” or “chocolate cake,” I just sent her a link to that recipe. I had it bookmarked for years but being the slightly incompetent baker that I am, it had never made an appearance. No lemon bars, no “any citrus dessert.” I wanted this tart, and thankfully, she obliged. The idea of blending an entire piece of citrus into a filling was also a bit of an anomaly. The flesh and juice is the part you want right? You’ve always been taught (even from us) that when you zest citrus, make sure you don’t hit any of the white pith. But throwing the entire thing in there (sans seeds of course), that seemed downright crazy. Crazy, yes. Delicious, even more so. 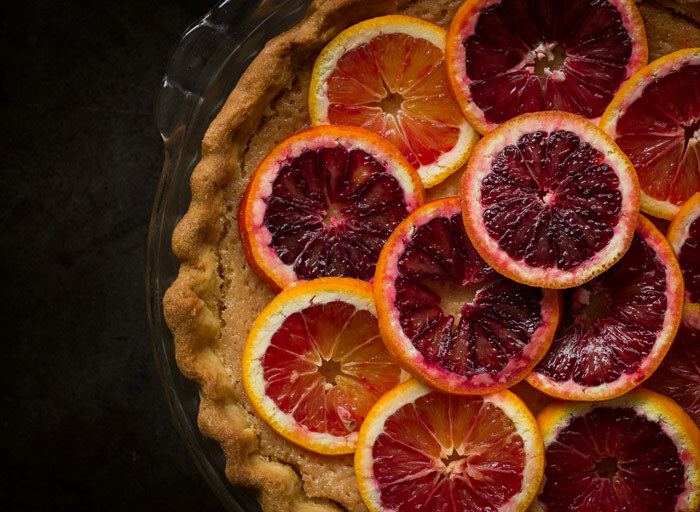 The tartness of both the zest and the pith gives the filling in Deb’s tart a pungent puckeriness (yes, I made that up) that will satisfy the biggest of citrus-dessert lovers. Plus, both the crust and filling are made in a food processor so it couldn’t be simpler. Ever since then, I had the idea in the back of my mind to change up the original recipe by substituting other types of citrus for a different flavor and color. When I saw blood oranges at the market, I knew this was the right time. 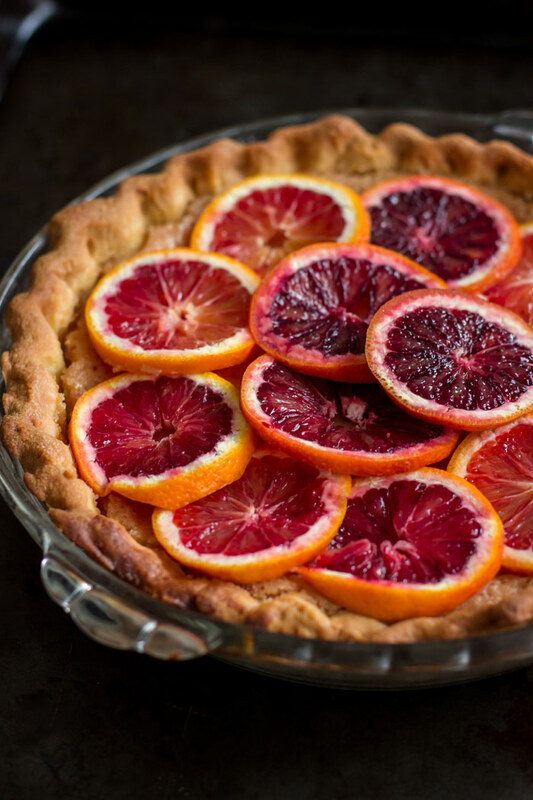 Instead of just lemon, for this filling you blend an entire blood orange plus a touch of lemon for extra tartness, into a prepared pie or tart crust. Use your favorite recipe, or just use a high-quality frozen crust. Anything works since it really is all about the filling. Due to the eggs and the lemon, it’s quite hard to get that bright red color in the filling so a subtle pink will have to do. 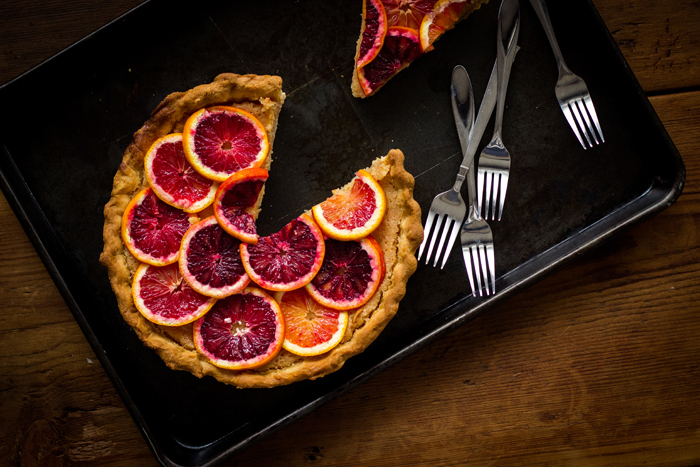 However, thanks to the advice of my blogger friend and baker / food styler extraordinaire Allie from Baking a Moment (who was giving me a much-needed photography lesson for this shoot), we decided to shingle additional sliced blood oranges on top. Genius. Ombré is so in, right? What I love about this dessert is that you can only really make this variation in the winter time. When you’re serving heavy and hearty stews and roasts, a lighter, tarter dessert is just the right way to round out a meal. Even better, you can make this a day or two ahead of time as it’s as good cold as it is room temp. Just make sure to add the sliced blood oranges on top just before serving. Special kudos for the photos and styling in this recipe go to Allie, who came over and spent several hours teaching me how to think differently about my photography set-up. Who knew that simply rotating to the other side of the dish could make such a dramatic difference? Thanks Allie! Now, hurry to the store and pick up some blood oranges before it’s too late! 1 9-inch tart shell or pie crust, half baked. I like this one. Partially bake your pie or tart crust according to recipe instructions. For a standard pie crust, use these instructions. Allow to cool completely. Slice 1 blood orange into rounds and remove the seeds. To a food processor, add the sliced blood orange and lemon (including the peel and pith), sugar, and butter. Process until smooth then add the eggs, cornstarch and salt and continue to blend until completely smooth. You might see some little bits of peel still in there. That's ok! Pour the mixture into the prepared tart or pie shell and bake for 40 minutes or until the filling is just set. 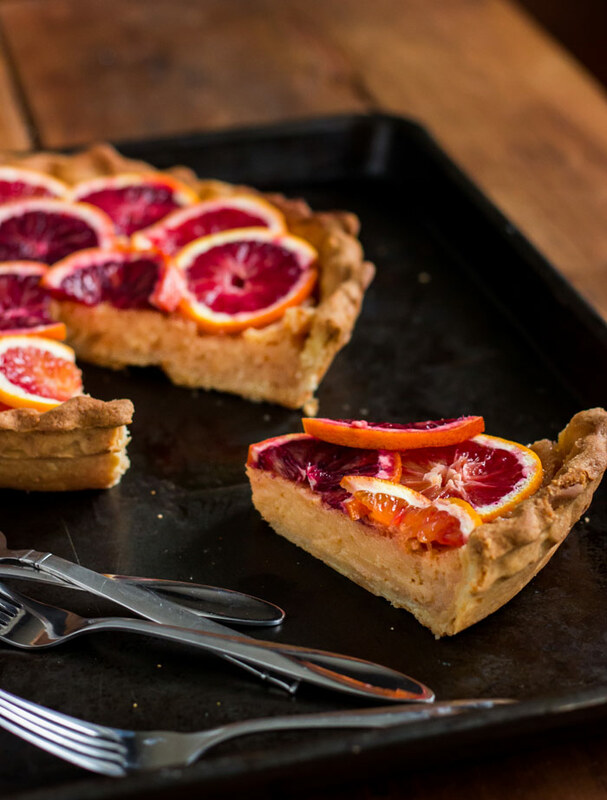 Slice the remaining 2 blood oranges into thin rounds and layer over the top of the cake in a shingled pattern. Slice and serve immediately or store in the fridge for up to 2 days. You knocked it out of the park! This is gorgeous, I’m having trouble deciding which photo to pin!! this recipe is missing some key instructions… help! Oops – something got messed up Kathryn! Fixing it now. OK, it should be fixed now. Thanks for the heads up! thanks… can you check step 6? Should be fixed now as well! Thanks for catching all of our mistakes – working too fast today! Thank you. I certainly didn’t mean it in critical way… only, how can a blood-orange-lover like myself make this beauty without the instructions? I understand the working too fast; that’s my usual, too. Thanks. Totally understand and I appreciate it!